The following is a sample essay you can practice quoting, paraphrasing, and summarizing. Examples of each task are provided at the end of the essay for further reference. Sipher, Roger. “So That Nobody Has to Go to School If They Don't Want To.” The New York Times, 19 Dec. 1977, p. 31. A decline in standardized test scores is but the most recent indicator that American education is in trouble. One reason for the crisis is that present mandatory-attendance laws force many to attend school who have no wish to be there. Such children have little desire to learn and are so antagonistic to school that neither they nor more highly motivated students receive the quality education that is the birthright of every American. The solution to this problem is simple: Abolish compulsory-attendance laws and allow only those who are committed to getting an education to attend. This will not end public education. Contrary to conventional belief, legislators enacted compulsory-attendance laws to legalize what already existed. William Landes and Lewis Solomon, economists, found little evidence that mandatory-attendance laws increased the number of children in school. They found, too, that school systems have never effectively enforced such laws, usually because of the expense involved. There is no contradiction between the assertion that compulsory attendance has had little effect on the number of children attending school and the argument that repeal would be a positive step toward improving education. Most parents want a high school education for their children. Unfortunately, compulsory attendance hampers the ability of public school officials to enforce legitimate educational and disciplinary policies and thereby make the education a good one. Private schools have no such problem. They can fail or dismiss students, knowing such students can attend public school. Without compulsory attendance, public schools would be freer to oust students whose academic or personal behavior undermines the educational mission of the institution. Has not the noble experiment of a formal education for everyone failed? While we pay homage to the homily, "You can lead a horse to water but you can't make him drink," we have pretended it is not true in education. Ask high school teachers if recalcitrant students learn anything of value. Ask teachers if these students do any homework. Quite the contrary, these students know they will be passed from grade to grade until they are old enough to quit or until, as is more likely, they receive a high school diploma. At the point when students could legally quit, most choose to remain since they know they are likely to be allowed to graduate whether they do acceptable work or not. Abolition of archaic attendance laws would produce enormous dividends. First, it would alert everyone that school is a serious place where one goes to learn. Schools are neither day-care centers nor indoor street corners. Young people who resist learning should stay away; indeed, an end to compulsory schooling would require them to stay away. Second, students opposed to learning would not be able to pollute the educational atmosphere for those who want to learn. Teachers could stop policing recalcitrant students and start educating. Third, grades would show what they are supposed to: how well a student is learning. Parents could again read report cards and know if their children were making progress. Fourth, public esteem for schools would increase. People would stop regarding them as way stations for adolescents and start thinking of them as institutions for educating America's youth. Fifth, elementary schools would change because students would find out early they had better learn something or risk flunking out later. Elementary teachers would no longer have to pass their failures on to junior high and high school. Sixth, the cost of enforcing compulsory education would be eliminated. Despite enforcement efforts, nearly 15 percent of the school-age children in our largest cities are almost permanently absent from school. Communities could use these savings to support institutions to deal with young people not in school. If, in the long run, these institutions prove more costly, at least we would not confuse their mission with that of schools. Schools should be for education. At present, they are only tangentially so. They have attempted to serve an all-encompassing social function, trying to be all things to all people. In the process they have failed miserably at what they were originally formed to accomplish. Example summary: Roger Sipher makes his case for getting rid of compulsory-attendance laws in primary and secondary schools with six arguments. These fall into three groups—first that education is for those who want to learn and by including those that don't want to learn, everyone suffers. Second, that grades would be reflective of effort and elementary school teachers wouldn't feel compelled to pass failing students. Third, that schools would both save money and save face with the elimination of compulsory-attendance laws. Example paraphrase of the essay's conclusion: Roger Sipher concludes his essay by insisting that schools have failed to fulfill their primary duty of education because they try to fill multiple social functions (par. 17). Example quotation: According to Roger Sipher, a solution to the perceived crisis of American education is to "Abolish compulsory-attendance laws and allow only those who are committed to getting an education to attend" (par. 3). Title page from A Paraphrase, and Annotations upon All the Books of the New Testament, George Wythe Collection, Wolf Law Library, College of William & Mary. 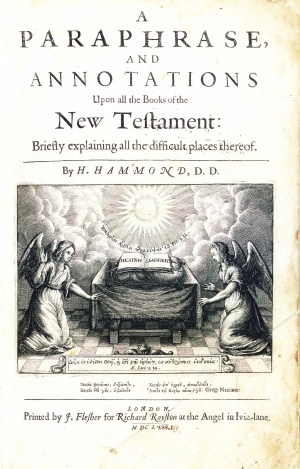 Henry Hammond (18 August 1605 – 25 April 1660) was an English churchman widely regarded as an excellent preacher and orator, as well as a diligent scholar of both religious texts and literary works. A loyalist clergyman, Hammond’s clerical activities included serving as the Archdeacon of Chichester, obtaining a canonry at Oxford's Christ Church, and acting as a royal chaplain. Parliament had him restrained for ten weeks in 1648 for his loyalist leanings, though he was subsequently allowed to move to his friend’s house where he was permitted to continue his ministerial obligations. Remaining there for about two years, Hammond preached only to a small, impoverished church. When King Charles I was put on trial in 1649, Hammond wrote on his behalf to the Council of War. Thomas Jefferson listed "Hammond's New testament. fol." in his inventory of Wythe's Library, noting that he kept the volume himself. He later sold a copy of the 1653 first edition to the Library of Congress. The copy still exists, but it contains no Jefferson or Wythe marks of ownership. Instead, it has the inscription "Richard Dunn, 1724" on the title page. Both Brown's Bibliography and George Wythe's Library on LibraryThing include the Library of Congress volume as Wythe's former copy. The Wolf Law Library purchased a copy of the same edition. Bound in full leather with recent rebind and new endpapers. Includes Greek, Latin and English marginalia throughout the volume. Purchased from Cobweb Books. ↑The Dictionary of National Biography, s.v. "Hammond, Henry (1605-1660)." ↑John Fell, The Life of the Most Learned, Reverend and Pious Dr. H. Hammond (London: J. Flesher, 1662). ↑Hugh de Quehen, "Hammond, Henry (1605–1660)" in Oxford Dictionary of National Biography (Oxford University Press, 2004- ), accessed Oct. 1, 2013. ↑Arthur Middleton, Fathers and Anglicans (Herefordshire: Gracewing, 2001), 158-167. ↑ de Quehen, "Hammond, Henry." ↑Michael McGiffert. "Henry Hammond and Covenant Theology," Church History 74, no.2 (June 2005): 256. ↑E. Millicent Sowerby, Catalogue of the Library of Thomas Jefferson, (Washington, D.C.: The Library of Congress, 1952-1959), 2:102 [no.1488]. ↑LibraryThing, s. v. "Member: George Wythe," accessed on June 28, 2013. Marginalia, Romans, chapter 11, verses 29-30, page 523. Headpiece, "A Premonition Concerning the Interpretation of the Apocalypse," page 904.